Today we have chosen a beautiful verse that reminds us that God holds us with His righteous hand. 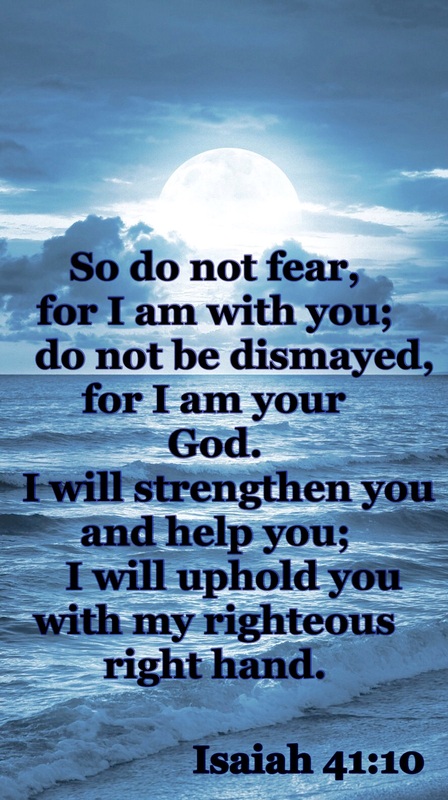 He tells us not to fear or even be dismayed but to remember that He is God…our God. Print the photo and put it on your refrigerator, tape it to your bathroom mirror, pin it over your computer at work, or save it as your phone’s lock screen. Get it into your heart so you can breathe The Word. Read the verse. Close your eyes and ask God how many times He would like you to write it. Open your journal and write it exactly like He had Isaiah pen it for you and as many times as you heard Him say. Now ask God what He wants to show you about this verse. Ask Him what it means for you? Write what you hear in your journal. Let your head get out of the way and allow the words to flow through your pen. Write from your heart. ~ It’s Breath on Paper.